This large and elaborately illuminated vellum document is an establishment charter known as a "patent of erection" for a chapter of the Confraternity of the Holy Rosary, one of the largest devotional societies in the Roman Catholic Church. Confraternities, also known as sodalities, are religious counterparts to secular clubs and are most often associated with Roman Catholicism, though similar societies also exist among the Anglican and Orthodox branches of Christianity, as well as within a small number of Protestant denominations. The Confraternity of the Holy Rosary, governed by the Dominican Order, is organized around commitment to a specific devotional practice: that of praying the Rosary at least once per week. This prayer is quite ancient in form, and is generally held to have been written and promulgated by St. Dominic himself as an antidote to heresy and sin in the late twelfth or early thirteenth century. Organizations devoted to the regular recitation of the rosary are documented as early as the 1470s, and numerous later popes commended the practice as an excellent devotion and granted benefits to members of this confraternity. These various pronouncements were collected and formalized most recently in the late nineteenth century in the "Apostolic Constitution on the Rosary Confraternity," issued by Leo XIII in 1898. To aid in the counting of the numerous recitations of these prayers, a small device resembling a beaded necklace developed, with each individual bead representing one iteration of the Rosary prayer and divisions placed at the end of each "decade." Like the prayer, this counting device is also known as a "rosary" or as "rosary beads." 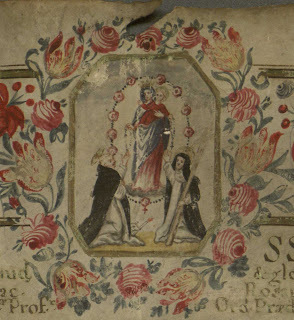 Three of these rosaries are depicted in the illuminated miniature on this manuscript, which is discussed in detail below. IN NOMINE S[ANCTI]S[SIMAE] TRINITATIS, Patris, & Filii, & Sp[irit]us S[ancti], & ad laud[em] & gloriam B[eatissi]mae Dei Genit[rix] V[irginis] M[ariae] pia[m]q[ue] venerationem D.P.N. Dom[ini]ci Sac[ri] Rosarii Authoris atq[ue] Institutoris Fr[ater] Antoninus Cloche Sac[ri] Th[eologi]ae Prof[esso]r, Ord[inis] Praedic[torum] humilis Mag[ister] Gen[eralis], & Ser[vu]s.
IN THE NAME OF THE MOST HOLY TRINITY, Father, Son, and Holy Spirit, and for the praise and glory of the most blessed Mother of God the Virgin Mary, and the pious veneration of D.P.N. Dominic, the author and founder of the Holy Rosary. Brother Antoninus Cloche, Professor of Sacred Theology, Master General and servant of the humble order of preachers. 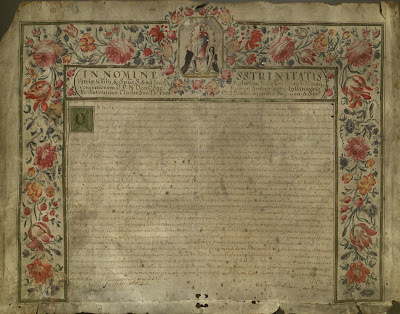 The text thus indicates that this charter was given under the auspices of Antoninus Cloche, one of the most important master generals of the Dominican Order, who led the Dominicans from 1686 until his death, at age 92, in 1720. Cloche is not invoked as simply the symbolic author of the document, as his signature may also be found in the lower left corner of the text, with the date on which the charter was issued, the 20th of May, 1710. The body of the text also appears to indicate that this new chapter of the confraternity is being established at a monastery in the diocese of Nocera (Latin Nucerinensis) which is in Perugia, Umbria, Italy, though additional study is needed to determine the precise location of this branch of the sodality. 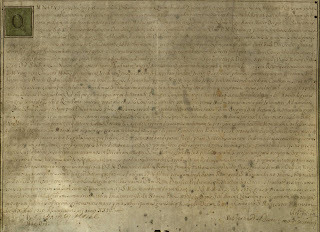 The document itself measures 39 x 51 cm. 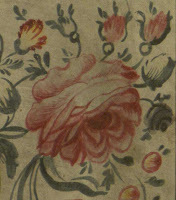 and includes an elaborate three-quarter floral border edged in green, nearly 7 cm. wide, in colors of blue, pink, orange, red, and yellow, which features a large central illuminated medallion. The text is written in Latin in a fine early-eighteenth-century secretarial hand with moderate abbreviation, and opens with an elaborate invocation set off within its own border, while the body of the text begins with a large illuminated initial "O" bordered in black and depicted on a background of green. The manuscript is rather dirty and faded in some places, though the colors generally remain vibrant and the text is eminently readable. The edges also are somewhat ragged, with small holes and tears on all sides, generally confined to the outer margin, though in two places impinging on the illuminations; in no place is the text affected by this damage. The most significant artistic aspect of the manuscript is the presence of a fine illuminated miniature in the upper margin. There, the floral border includes an elaborate central medallion (6 x 8 cm.) surrounded by additional floral patterns, which contain an image of Mary holding the infant Christ, flanked by St. Dominic and an unidentified female Dominican saint. Mary is depicted hooded and crowned, robed in blue and pink, holding a rosary in her right hand while in her left she holds the infant Christ. Christ, with a celestial halo, is clothed in red and also holds, in his left hand, a rosary. The pair is shown elevated within a third large rosary, of which each bead is represented as a pink rose, the entirety of which functions almost as a window, as it were, through which the two Dominican saints below may look upon the Mother and Child. In this way, the metaphor of the rosary as a window to Mary and Christ is made literally manifest in the illumination. St. Dominic (1170-1221), founder of the Dominican Order and author of the Rosary, is represented kneeling below and to the left of Mary and Jesus, tonsured and in the black and white Dominican habit, left hand lifted to the Virgin and Child and right hand clasped to his chest, with the traditional iconography of a dog carrying a torch visible at his feet, looking out from behind his robes. This latter association likely derives from a pun on the Latin term for a Dominican friar, Dominicanus, which rather resembles domini canus, "dog of the Lord." The Golden Legend reinforces this imagery, reporting that Dominic's mother dreamed during her pregnancy of giving birth to a dog holding a torch in his mouth with which he would burn the world ("And his mother, tofore that he was born, saw in her sleep that she bare a little whelp in her belly which bare a burning brand in his mouth, and, when he was issued out of her womb, he burnt all the world"). This image later became the symbol of the Dominican Order. On the right of Mary and Jesus kneels a female Dominican saint, robed in the traditional white and black habit, her right hand extended up to Mary and Jesus while with her left she supports a large wooden cross, which reaches from the ground before her to over her right shoulder. Her precise identity remains unclear, as many Dominican saints may be depicted in this manner, though it is possible that she represents St. Rosa of Lima (1586-1617), whose name suggests an affinity with this confraternity ("St. Rose"), though it is not clear that there is any hint of the crown of roses that often accompanies her image. A second possibility is that the depiction represents Catherine of Siena, another Dominican tertiary saint, who is often represented in a similar manner. The historical importance and fine, readable penmanship of this manuscript, combined with the stunning border and its extraordinary central medallion make this a particularly excellent selection from the Brandeis holdings, and one which has only recently been made available for scholarly study. Thurston, Herbert, and Andrew Shipman. "The Rosary." The Catholic Encyclopedia. Vol. 13. New York: Robert Appleton Company, 1912. 1 Apr. 2009 (http://www.newadvent.org/cathen/13184b.htm). The Golden Legend or Lives of the Saints, vol. 4. Compiled by Jacobus de Voragine, Archbishop of Genoa, 1275. First Edition Published 1470. Englished by William Caxton, First Edition 1483, Edited by F.S. Ellis, Temple Classics, 1900 – available online at http://www.fordham.edu/halsall/basis/goldenlegend/gl-vol4-dominic.html. Thank you for this post, including the well-written text. What a treasure the illuminated document is! Thank you for this very interessant post. Please, can you tell the inventory number of this manuscript ? We are glad you enjoyed this post! This manuscript does not have an inventory number; it is currently unprocessed. If you would like to refer to it in a note, it can be called Charter of the Confraternity of the Holy Rosary, unprocessed manuscript, Robert D. Farber University Archives & Special Collections Department, Brandeis University.